Spectrum Plumbing and Heating has in its Service Department, trained and certified Medical Gas Installation Journeymen. Our Medical Gas Installation Journeymen are certified by either the (METC) Medical Equipment Training or the Piping Industry Progress and Education Trust Fund (P.I.P.E.). ​Traditional water heaters are designed to heat and store water in a tank, usually 40 or 50 gallons at a time. When someone in your home takes a shower or bath, the pre-heated water stored in the tank flows to the point of use (the shower head). The tank is filled again with new water from your water source. When the water in the tank cools off, the fuel ,or electricity turns on and heats the tank up again. Then your shower, faucet, dishwasher, or washing machine, hot water is ready for you to use. 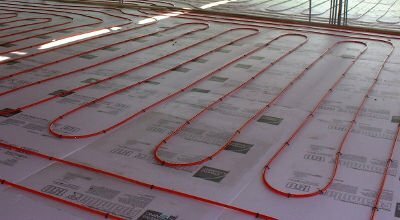 Radiant Floor Heating: In a radiant floor heating system, warm water flows through flexible plastic tubing called PEX that is located underneath or within the floors. The PEX tubing carries the warm water into specific rooms or “zones” to effectively heat people and objects in every corner of the room. Spectrum Plumbing and Heating is a full service commercial and residential company. Our goal is to form lasting relationships with our clients by providing the highest level of service, professionalism, and craftsmanship. We have a special interest in energy efficient plumbing and heating systems, and hold many green building certifications. Call now to schedule a service or free estimate!